Studio 20m2 renovated with kitchenette (hood, plates, fridge), living room, shower room. 1st and last floor, Apartment composed of a kitchen open on stay, a room. 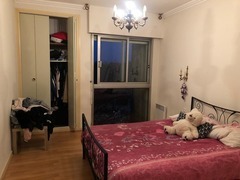 Furnished renovated in quiet street, balcony, cellar. Balcony, cellar, local bike. In perfect condition, beautiful view, prox shops and tram.